Tweak is an online self-service design library which makes tweakable press advertising and marketing collateral available to users at the touch of a button. Simply change colour, copy, photos, logos and Calls to Action, to create a compelling piece of advertising and marketing. CEPIC: Jerry Kennelly: Secrets of His Dramatic Exit from REELDEALHD on Vimeo. 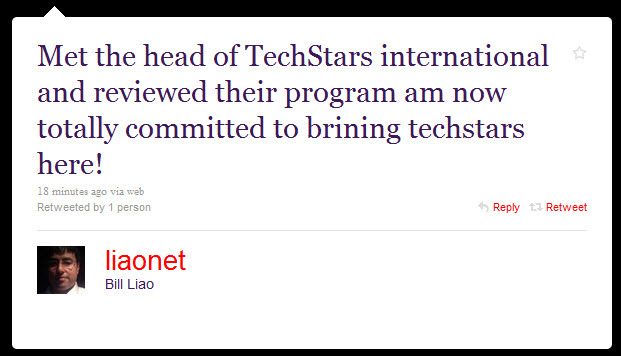 Bill Liao to bring TechStars to Ireland? Bill Liao, serial entrepreneur, co-founder of Xing and philantropist has just indicated that he wants to bring TechStars to Ireland! Get your startup funded and off the ground while learning from the best. Get up to $18,000 in seed funding for your new company, plus the chance to pitch to angel investors and venture capitalists at the end of the program. At the end of the three month program, it’s your company. TechStars is the best way to get your new company off and running and on a path to success. TechStars companies get 40+ educational opportunities during the program. Learn from over 50 highly accomplished mentors. I’ve only met Bill briefly and have his book Stone Soup on my desk waiting to be read. His energy and positivity is infectious. Given what he has achieved both in business and through his work in Neo/WeForest, I have no doubt TechStars is going to happen and deliver results for the startup community here.